I lost 1.4 at weigh in this week, putting me at 166.4 (!). That means I’m only 6.4 pounds from my goal weight and have lost 15.2 pounds since recommitting in December!!!!! I recently realized that today is my two year anniversary with Weight Watchers! I joined March 3, 2009 and my life has changed so dramatically over these past two years – I couldn’t be happier. And now, onto the important stuff. A new recipe. 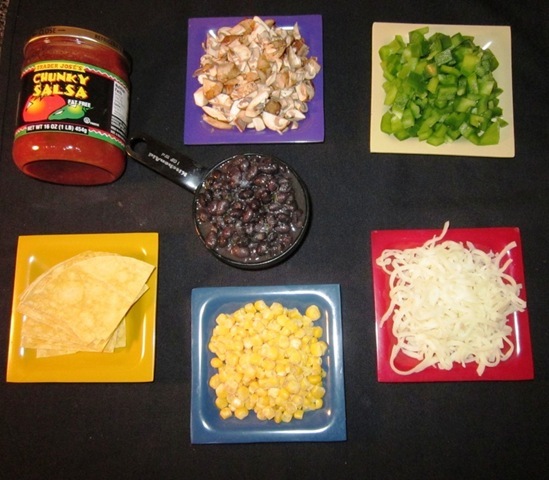 Corn tortillas are a staple in my kitchen. I ALWAYS have them on hand because they are super versatile, so cheap (just 79 cents at Whole Foods for organic ones! ), delicious, and very points+ friendly (1 pt+ a piece). When I saw a corn tortilla casserole on Caitlin’s blog, I knew I had to have it. She got the idea from Tina, and the idea has been circulating around the blog world ever since. You all know by now that it’s nearly impossible for me to follow recipes, but I wanted to use the basic premise. It’s basically like a Mexican lasagna, with tortillas in place of noodles, and the best part is this dish is super easy, economical, and absolutely incredible. I had been dreaming up what exactly I would put in my version of the dish, and last night was finally the night. It did NOT disappoint. Entire recipe is 2 servings, 7 pts+ per serving. Printable version here. First, preheat your oven to 400º. Next, heat up the canola oil in a pan over medium heat. 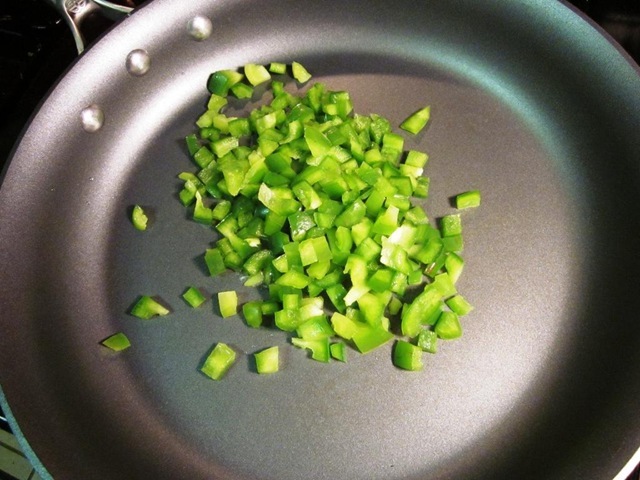 Once that is hot, add in the bell pepper. 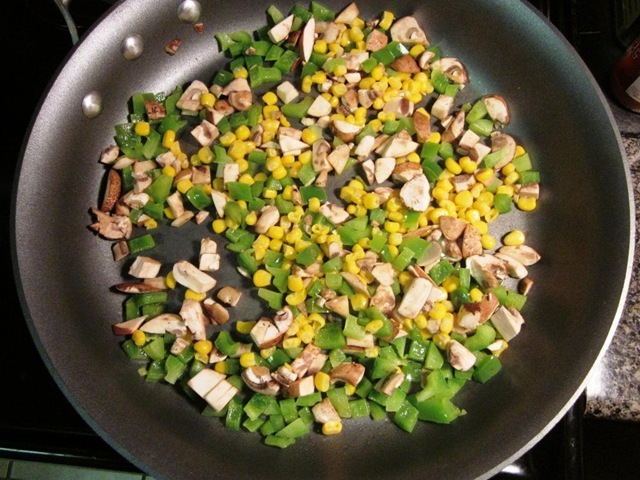 Let the bell pepper cook for 3-4 minutes until it’s starting to get soft, and then add in the corn and mushrooms. 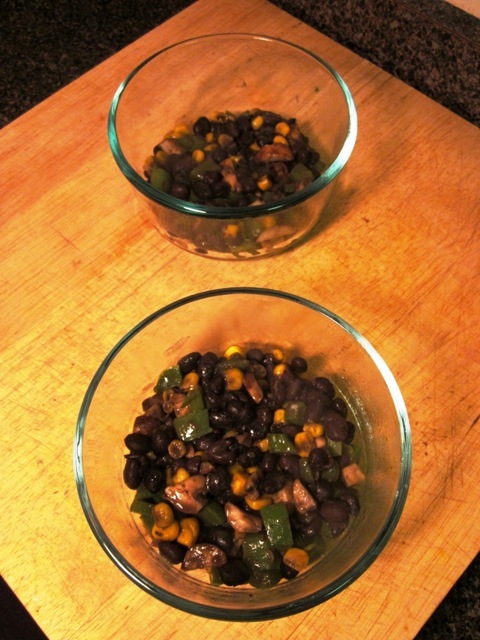 Sautee for another 3-4 minutes until everything is cooked and heated through, and then add in the black beans. Since the beans are already cooked, you just want to get everything hot and then your filling is complete. 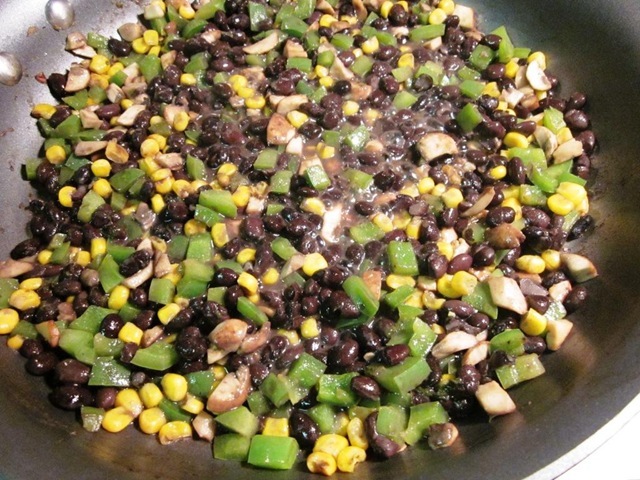 Start by splitting about half of the filling mixture between the two casseroles. 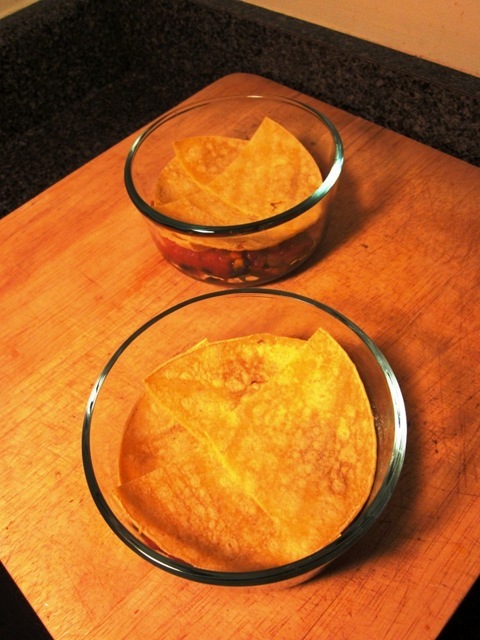 Next add in 1/4 cup salsa to each dish and top with 4 pieces of the tortilla each (one tortilla in each dish). Now divide the rest of the filling, the rest of the tortillas, and the rest of the salsa evenly between the dishes. Finally, top each with half of the cheese. Check out all those layers! Put it on your preheated oven for 20 minutes, then turn up the heat to 450 and let cook for 5-10 minutes more until the cheese is browned and bubbly. Garnish with scallions if you like. I ate it with a serving of chips and extra salsa on the side for 10 pts+ total. Heavenly! It was seriously SO good. The corn tortillas soak up the salsa and take on this incredible texture. The casserole was a pretty large serving too, and it was really filling and hearty. 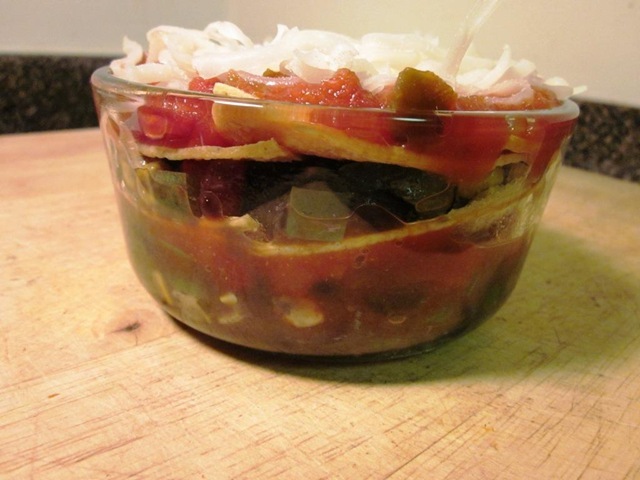 I also loved how much flavor the salsa gave to the whole dish. Notice there was no salt, pepper, or any spices, but it was bursting with flavor. I will absolutely be making this again, and I suggest you do the same! What’s your favorite kind of casserole? Feel free to share links in the comments section! definitely have to try this one. my hubby is crazy about mexican! Wow, that looks incredible and easy to make. 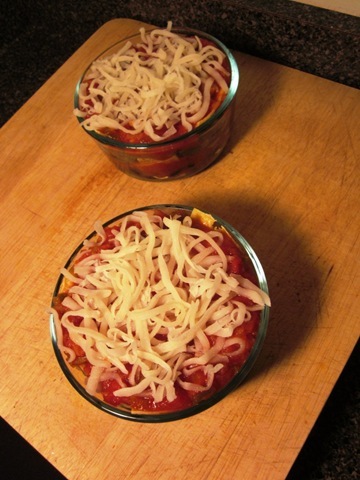 I am going out and buying those mini casserole dishes this weekend I will make them too. Contrats on your weight loss, and a healthier life style. You go girl. Beth, congrats on the loss!! You are an inspiriation!! I love anything Mexican and these look absolutely delicious! I’ll be trying soon!! Thanks. I think I just died and went to Mexi-heaven. I must try these ASAP! That looks really delicious! I’m going to try it for sure. Congrats on the weight loss….you are killing it! Those mini cassarole dishes sound awesome. Where did you get them? I must know. I love the Chicken Spinach Lasagna on the Weight Watchers website. I make them in bread tins and it makes 2 hearty servings in each tin. I freeze 3 tins and eat one right away! Its one of our go to meals. I got them on Amazon. Here’s a link to them! They are AWESOME. Your weight loss really is an inspiration to everyone that reads your blog! So so happy for you! Honestly, it makes me want to go! I love casseroles but I always am afraid they are never healthy – but I have to try yours! Congrats on your weigh-in success! I’m so impressed with your dedication and progress! 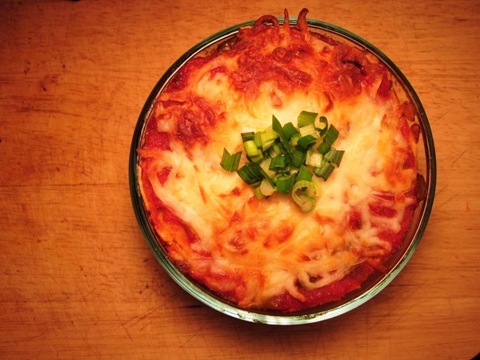 That casserole looks awesome… I am definitely going to have to try it! Oh yum!! That looks fantastic. I LOVE that they are portion sized! Such a great idea! With casseroles I tend to over eat portions. This looks so yummy! I make something similar to this with chicken I’ve cooked all day in a crock pot, topped with salsa. The chicken just falls apart and shreds so nicely! I like that you used corn tortillas. Sooo much healthier! Wonder if I could get my BF to like them? I think this dish is amazing and would appeal to guy too because it’s really hearty! You could also do some lean ground beef, turkey, or chicken in with the filling – just make sure its fully cooked before you bake the casserole. Congrats on your great loss and being so close to goal! Also, happy WW anniversary! haha yes we did cook similar dishes tonight!!! Congrats Beth on your weight loss – you are doing so amazing! Hi. I came over after Lisa’s shout out to you. I live in Reston, VA.
Glad to see a “neighbor” in the blogworld. Congrats on your loss, you are SO close to your goal!!!! 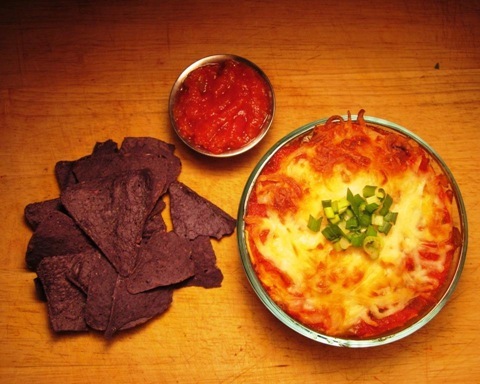 I make a similar casserole, but with enchilada sauce and on a much larger scale and the family devours it. Delicious! 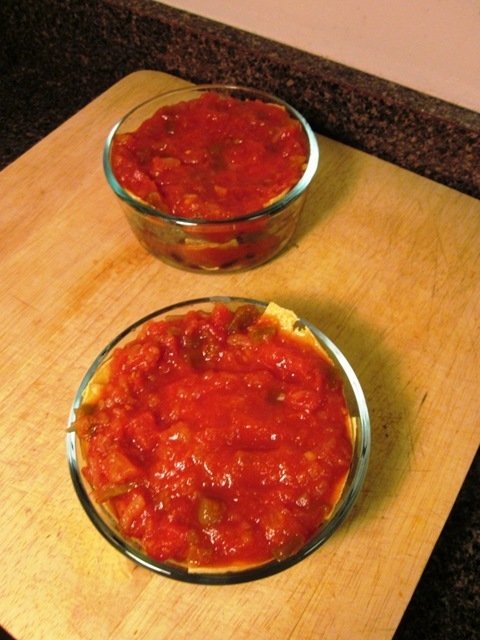 Love the idea of the instant portion control of these healthy mini mex casseroles. Beth, Holy crap–I made this for lunch today; it is DELICIOUS! I added a little bit of shredded pork for an additional 2pts+, and it’s so yummy. Thanks for this great recipe! Yay so glad you tried these and loved them! I have them on my list to make again soon… its been too long! This is BY FAR my fav recipe!!!! AMAZING!!! I also bought the bowls you use and I was soooo excited to have my lunch the next day!!! Thank you so much!!!! This will definately be a weekly recipe for me.